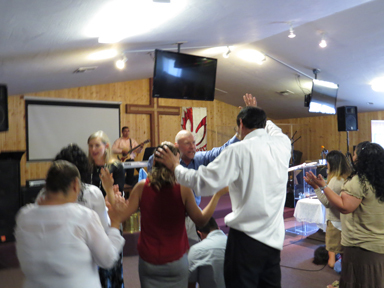 We just ministered in Medford, Oregon and had a very powerful outpouring of the Holy Spirit as we preached and prayed for the people there. It was at a church in Oregon led by some friends from way back who we lost contact with over the years and who we just reconnected with recently. They were deeply touched when we ministered at another church of theirs many years ago and wanted to get in touch to have us minister with them again. They ran into a mutual friend who reconnected us and so we made the trip up to Oregon. 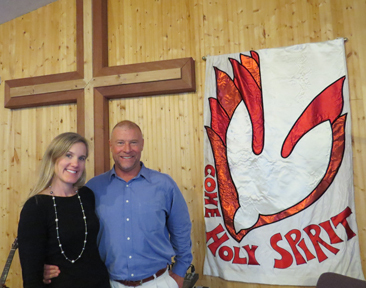 The Holy Spirit met us in great power and touched most everyone in their congregation. 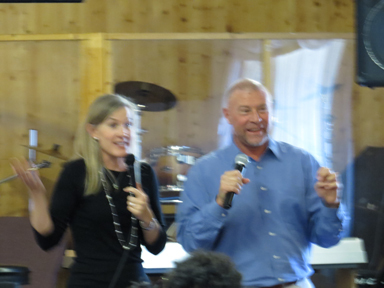 We received many testimonies afterwards of lives touched and transformed by the power of God poured out that day! Shortly after this we were at dinner with some friends telling them what just happened in the desert. As we walked out of the restaurant I ended up in a conversation with the hostess of the restaurant who also just happening to be walking out. We ended up sharing the Lord with her and right in the middle, right in front of the restaurant, the Holy Spirit fell on her and she began to cry profusely. We prayed with her and our friends Jeff and Jeanette and myself and Mercedes laid hands on her as she re-surrendered her life to the Lord. The Holy Spirit touched and filled her in a powerful way as she rededicated herself to Christ after some time drifting away in her life! Glory!! 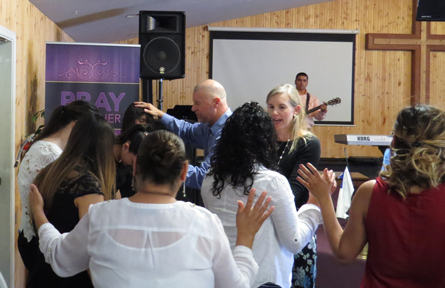 We’ve also been ministering recently down near the border where the Holy Spirit has met us in power. We were having a special service on a Sunday recently where we set it up to have our son Patrick and his friend from Sweden, Petrus, each share a bit of the service we were ministering at and tell a little of how God has worked in their own lives. While referencing how we are instructed to “ask and we shall receive” Patrick shared a couple stories of answers to prayers that came in unusual ways as well as how he was powerfully filled with the Holy Spirit unexpectedly on a certain occasion (we have a short blog on this so link here.) Petrus also shared about the filling of the Holy Spirit and how it is the Lord’s will and desire to have us fan into flame that fire of the Spirit. He also shared his desire to take that fire back into Europe and Sweden specifically, which is something on our hearts as well. John Wesley talked about the importance of preparing the next generation. It was a blessed time to see these youngsters—wow, feels weird using that word—challenged to step out and testify about Christ’s goodness. They learned that God is with them and helps them even when they are a little bit nervous and that He will glorify Himself through us when we step out to serve Him! Thanks for your prayers and support. We deeply appreciate it, especially as we step back out to take the fire ourselves as we travel back to Europe once again this summer. It only takes a glance at the headlines these days to see the dire shape the place is in and how it needs a return to the Gospel. The Philistines are shaking up the place like in the days of Israel so join us in prayer and support as we reach out to turn hearts back to Christ and His saving power! Please prayerfully consider supporting us in our upcoming mission trip to Europe. We always appreciate and are so grateful for all your prayers and support of our ministry.